Thank you to everyone who supported us and helped us make the Top 100 Indie Games for the second year in a row (last year we were an "Upcoming Game")! 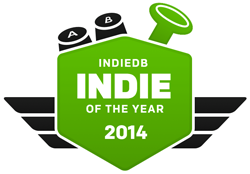 We greatly appreciate IndieDB and its members for all they've done for us and our game! As you can hear by the sound effects present in our Teaser, Power Up Audio (of Crypt of the Necrodancer and Towerfall: Ascension) have done an incredible job for us! You can find them at www.powerupaudio.com. 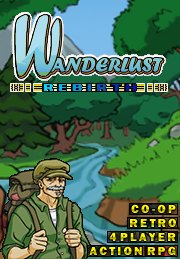 Wanderlust Adventures is now nearing Beta! We hope to meet an Early 2015 PC/Steam launch deadline, so the coming months of work/debugging will be crucial for us. During the Beta, we will be inviting a small number of fans (and Twitch streamers) to help us 'work out the kinks', in order to polish the experience into virtual perfection. Also, during this time we will be adding some more event/quest content into the game ~ to take advantage of the procedural generation we've implemented into the engine. Come check out the trailer and official sound track for Wanderlust Adventures; an online, free-roaming, action adventure RPG! Lauren finished the promotional piece and dungeon examples! Read all about it! New character graphics, companion system, and more! Is CD-key purchased in another source (gamergate) can be used for activation (in library) game here? You know I agree that its each developer's choice if they give out steam games to a different platform, but indie games often do it much differently to actually get sales in the 1st place. I know I'd rather have it on steam to manage all my games across computers in one program so I'll hold off until a steam sale arrives. The game seems interesting enough for me to buy at a discount price. However whats wrong with asking when this is a common practice? Its like you telling people to stop asking for discounts at stores. Some stores do some don't but doesn't mean you shoud get butthurt over it... I buy games for $60 because most times those games are worth it, and I'm willing to bet that this game is not comparable at such price point. Publishers like locking the sold game to one platform to encourage people to buy it again somewhere else. (Yet some keys also are valid on steam and ea does allow most older games to be activated on origin if you contact them) Indie games like being "free" of such constraints alot of the times. Well thats a long post, tl:dr, the **** is up with your qqing? I don´t get the point why you don´t do that, but every other developer who uses greenlight does (like i will get a steam key for the great game "Towns"). I like your game, i really do, but I think it´s somehow unfair, since i don´t see the reason why you shouldn´t do that. Steam is a valued business partner to us, as well as Desura, and we believe that if you enjoy our game then they deserve your support as well. Well most other developers are willing to do it. I have had a number of them do it with no problems. Valve does fine. They aren't going out of business anytime soon but thanks for your concern for them. You also have to consider that you put your game here first so some people may have bought it early on to support you but then once the game got on Steam would still prefer to have the Steam key. I personally think it's pretty crummy to make them re-buy it. It's your game though. Do what you want. I won't be buying it and I will remember not to buy games from Yeti Trunk in the future. You can add the game to your Steam Library and there will be virtually no difference between the Steam version and the non-Steam version. You can play with Steam users with the non-Steam version as well. That's not the point. It's still a crappy way to treat customers who supported them early on before they got onto Steam. Again most other developers are willing to do this. Wait, so if you had bought the Xbox version of Mass Effect 2, you would have asked Bioware for a PS3 version when they released it later? Do you expect Nintendo to give you a free copy of Ocarina of Time on the Wii since you bought it on the N64 years ago? Over the past 18 months, we have added a ton of additional content, gameplay features, tweaks/balancing, suggestions by fans, and even ensured that both our Steam and non-Steam players would be able to all play together. 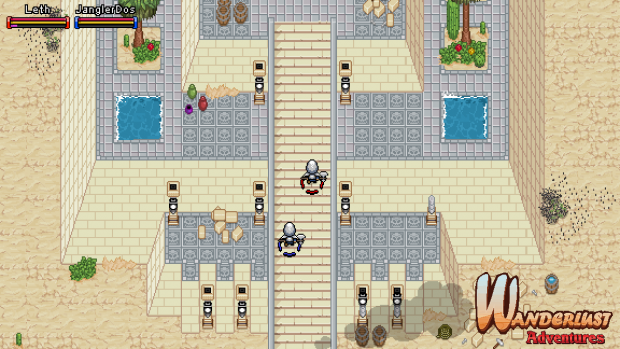 We gave away nearly 100 free copies of the game to Desura users and launched at half-off the regular price last December. We took part in a bundle where people could get multiple indie games at a discount price. I don't understand how we're being unfair to you; we've done far more than you ought to expect from a $10 video game purchase. We support Indie Developers. We support Starbound. We support Trine 2. We support Towns. We support Secrets of Grindea. We also support companies you've never even heard of because they're still working on their first game, and they have contacted us for advice. Yes, we're an indie developer, but we're also gamers like you. Yes, Indie Developers often give away free copies of their game, but we should not expect nor demand this from them. Instead, we should support them and encourage them, because - quite frankly - they need us more than we could possibly know. If you like their games, you should buy their games. If you like our games, you should buy our games. Rest assured, like many other indie companies, we'll make sure you get your money's worth. History shows that the majority is generally right. What do you mean the world isn't flat? Burn the witch! Jokes aside, I don't mind not getting the steam key free either. I've enjoyed your game, I've enjoyed watching it grow. I purchased a copy directly from the site and I'm not going to whine if I want it on Steam or Desura, because like you said, it can just be added to the library anyway. I'll admit that I'm not going to buy it twice because mainly I'm broke, but I do think support of indies is important and I say kudos for sticking to your guns on it. If anyone has sour grapes, they really ought to realize that this is what Indie Developers do to put food on the table. Yea, sometimes it's a hobby or for fun, but sometimes it's for a living. I think that's fair; I would have liked to get Steam keys too, but I don't really need it. Why? The devs haved worked hard to make sure we can all play together, so having it on Steam just means maybe 1 more game on your profile page? C'mon as long as you can play the game doesn't really matter where it is, and Desura's pretty awesome too. So I'm pretty fine with not getting keys, and also if you reeaaaaaaaaaaallly wanted it on Steam it's like real cheap on sale anyway if you reeeeaaaally want Steam achievements or the fact that it shows up on your profile page.